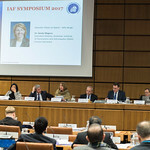 In February 2017, the IAF attended the 54th Scientific and Technical Subcommittee of the United Nations Committee on the Peaceful Uses of Outer Space (UNCOPUOS) in Vienna and reported about the Federation’s activities. The IAF also hosted an IAF Symposium on the topic of “What is at stake in space in 2017 and 2018?”. John Horack, Special Advisor to the IAF President moderated the Symposium. Among many other prominent speakers, many IAF VPs contributed to the symposium including Sergey Krikalev, Jan Woerner and Roberto Battiston. 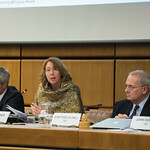 Simonetta di Pippo, Director of United Nations Office for Outer Space Affairs (UNOOSA), was also on the panel. The IAF also produced and presented a video on the different opinions of IAF Members on the topic.